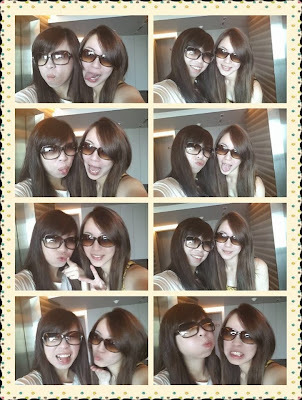 Continued from BKK Trip Day 2, here is the post for Day 3 of the trip! 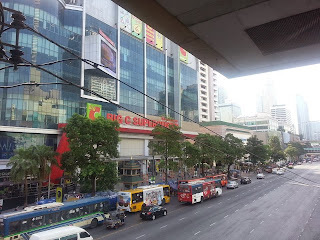 We walked to Big C Supermarket which was 5-10 minutes away. The Supermarket opened at 9am, and I began searching for the Tom Yum Paste. 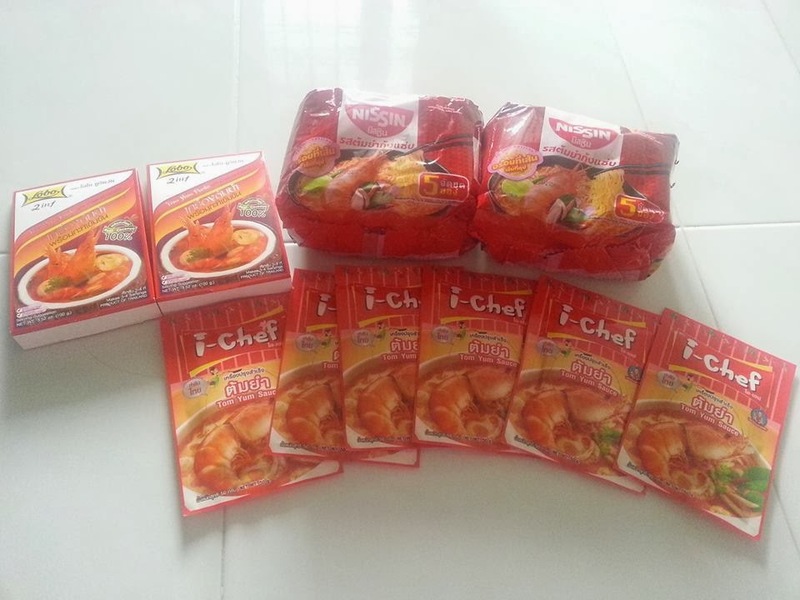 The gf also got some Nissin Tom Yum instant noodles as recommended by the local thai people. I got some too. Per pack of 5 packets of instant noodles cost S$0.80 only. That is amazingly cheap. I can start my cooking again. We had our brekkie at the McDonald at ground level of the supermarket. 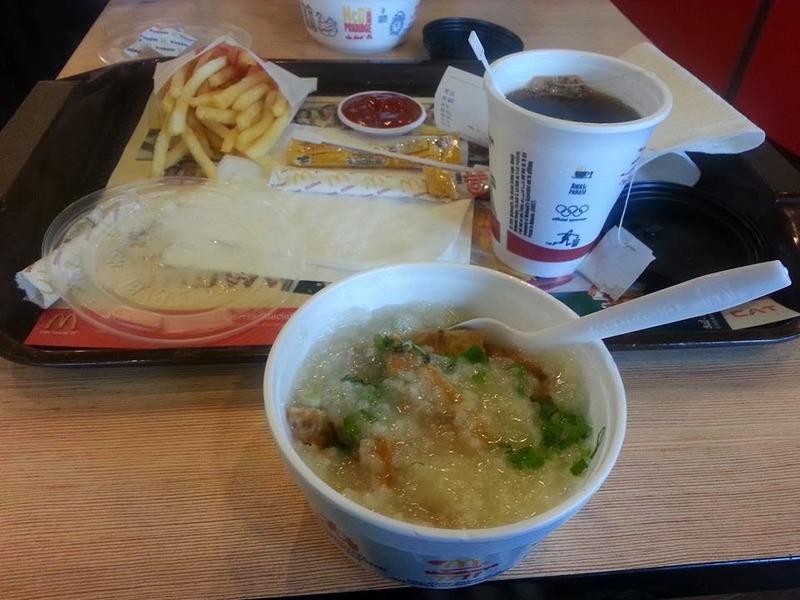 We had pork and chicken porridge respectively. After brekkie, the gf went to Central World first while I went to the Erawan Shrine (4-Faced Buddha) to pray. I would suggest for everyone to purchase the joss sticks/garland in the Shrine itself which costs 50Bhat. Do you know there are meanings to each side of the 4-faced buddha and the ways to pray to the buddha? Always start from the side facing the door and rotate to the left each time. After putting 3 joss sticks on each side and placing 1 garland each, move to the left and repeat the same steps. 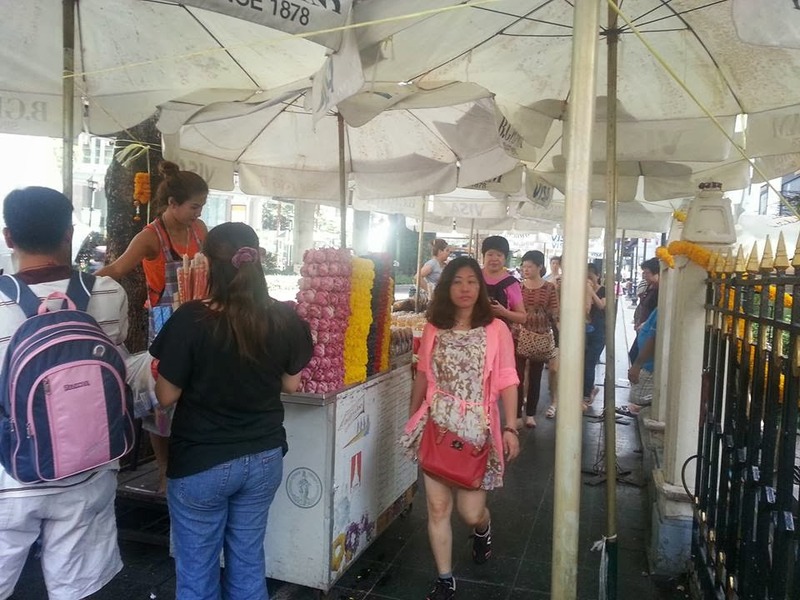 I would suggest not purchasing the joss sticks outside the Shrine, as they would charge tourists at a higher price. 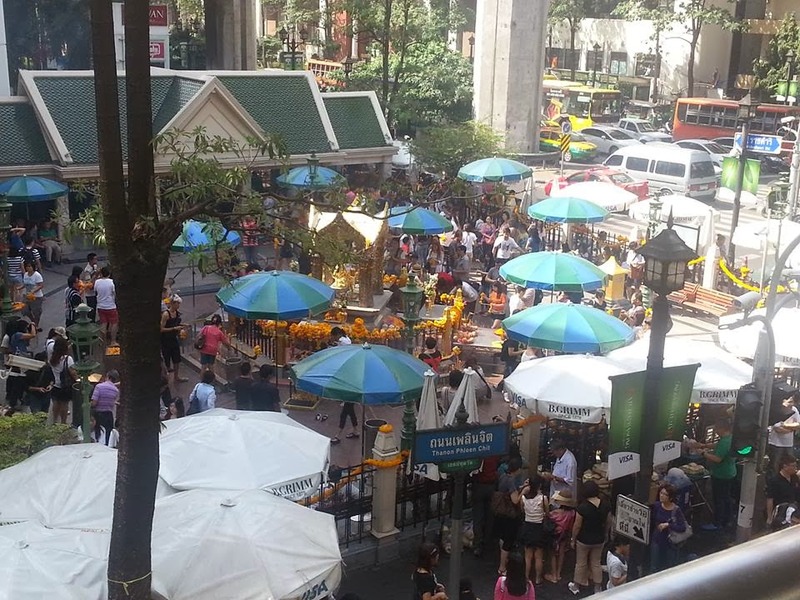 I set the meeting time at 10.40am to meet the gf outside Naraya shop in Central World. While on the way to Naraya, I went to buy a DVD at a shop which cost only 99 Bhat (S$4). The gf and me started our shopping in Naraya and we were there for around 45 minutes. In the midst of shopping, my phone rang and I saw the number, but I did not pick up. I was not ready to pick up any call. It made me think if it was related to after praying to the 4-faced buddha. It was around 11.30am and we immediately rushed to Isetan department store in Central World to buy lingerie. Lingerie is very cheap in BKK especially brands like Triumph & Wacoal. If you buy 3-5 pieces, there would be additional 15%-20% discount. If you purchased over 2000 Bhat, there will be 7% VAT refund too. We purchased quite a number of lingerie and if we purchased them in SG, it would cost around S$700 but can you imagined we only paid around S$269 for 8pcs of Triumph + Wacoal lingerie? It is very cheap and worth the price. It was already 12.20 pm after getting the VAT refund so we faster walked back to our hotel. Our room access card had expired so I rushed to the reception and ask them to re-activate our card and extend the time to 1.30pm for us. We packed as fast as we could and managed to check out at 1.20pm. We left our luggage in the hotel and walked around the mall (Platinum Fashion Mall 2) below our hotel. The gf bought some shoes and we were deciding on lunch. 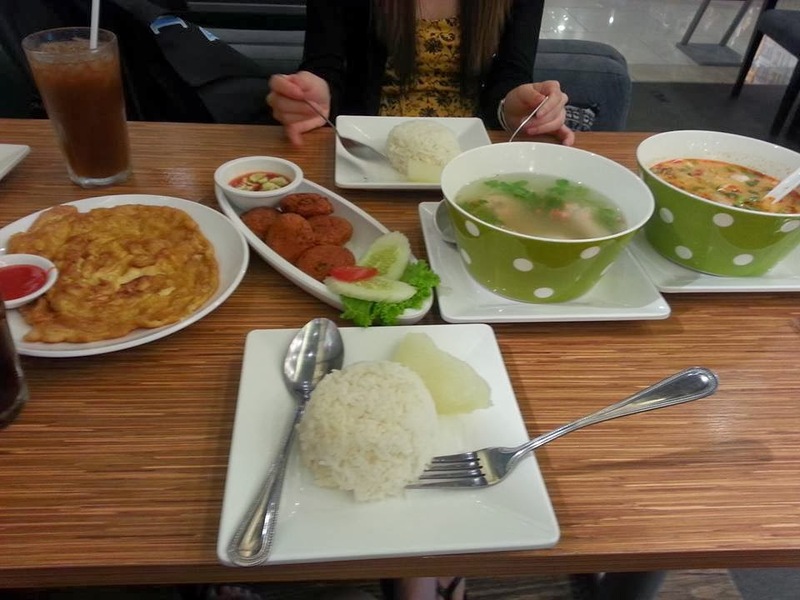 We decided to go Yum Saap at Central World again for Thai food lunch. 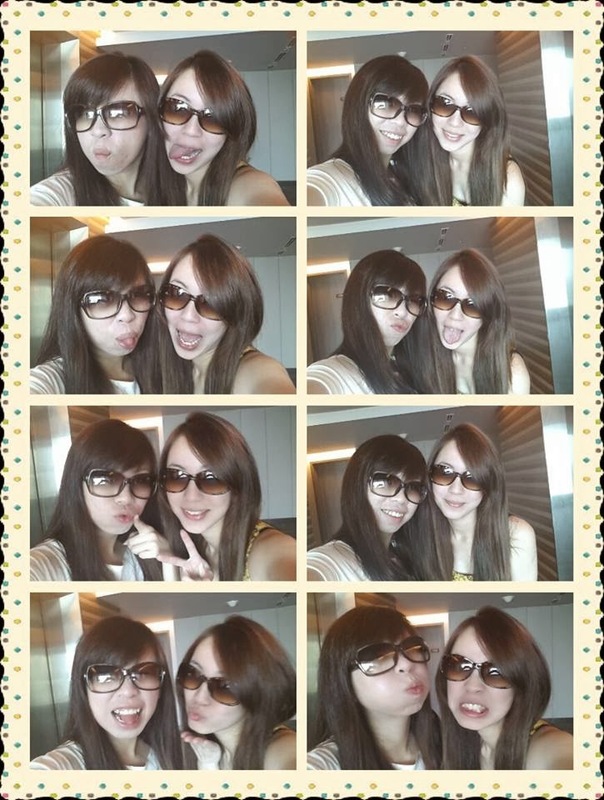 We finished lunch around 2.50pm and we walked to Platinum Fashion mall 1 again and clearing level 2 and level 1. I took a risk to purchase 1 classic elegant sleeveless top and I'm so glad I can wear it so nice as I have lost weight alot this 1 month. I think we finished clearing mall 1 at 5pm. 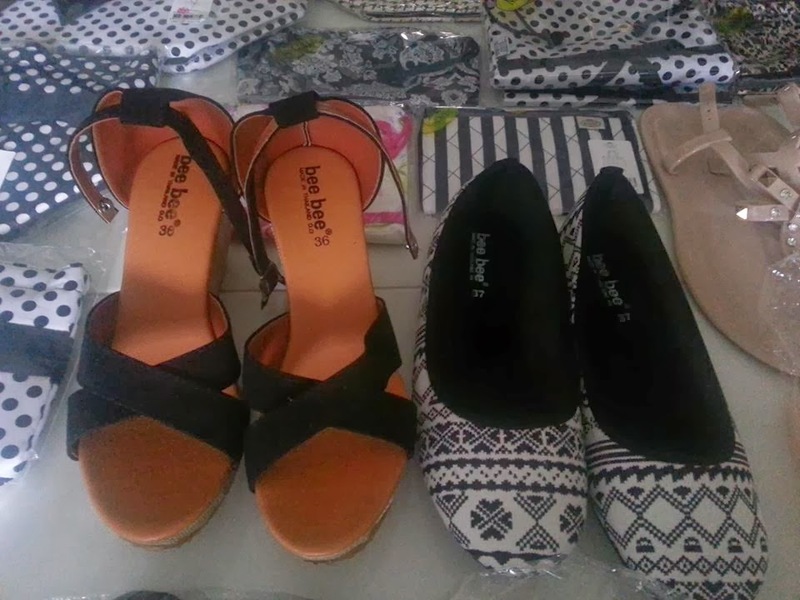 We then proceed to mall 2 where there are plenty of shoes and I bought 2 pairs (1 for the sis & 1 for me). Can you believe it cost only S$4.80 each? They are super comfy too. It was about time we need to go to the airport. We collected our luggage and do some last minute packing at the lobby. The hotel staff managed to call a cab for us but the taxi driver wanted 400Bhat instead of the metre. Since it was of reasonable price, we agreed on it. The taxi driver was a little annoying with his singing during our ride. Just as we were few hundred metres away from the airport, the taxi suddenly drove very slow and he opened his door and looked at the back tyre and he was groaning. I was telling the gf could it be punctured tyre? 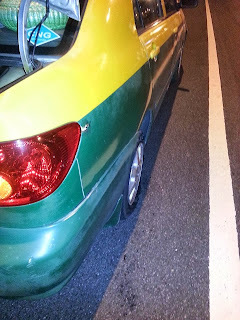 After travelling a short distance, the cab stopped on the road shoulder on the expressway. He told us to give him 10 minutes while he replaced the tyres. We were still slightly early so we waited on the road and it was kind of dangerous. A man approached the driver suddenly and asked if he needed help. The man offered to drive us to the airport since it was a small distance away. We paid the cab driver and hop on to another van. It was a mini tour van. The driver was very kind to offer to drop us at the airport and when I wanted to pay him, he refused. I insisted to give him 100bhat and he was paisei. Faith in humanity restored! We checked in on time and we settled our dinner at the airport. 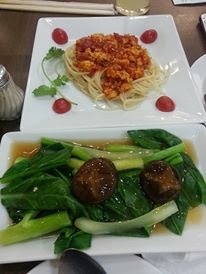 We shared a spaghetti and kailan, it was quite good! I also had a coconut drink. 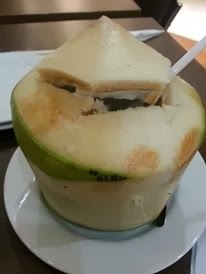 I'm in love with coconut drink ever since my last phuket trip with him. We were nearly late for our flight! Our flight was at 9pm and we were rushing to the boarding gate at only 8.42pm! Haha, we run all the way! We arrived SG at 12.20am. 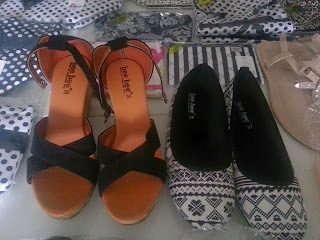 From this trip, I did not buy much stuffs which I'm quite surprised. Perhaps this is just a trip for me to nurse myself but my mind has been thinking non-stop daily and everyone has been advising me to remove that knot in me. My best buy was 2 maxi dresses which I loved alot and it was elegant and made me look slim. 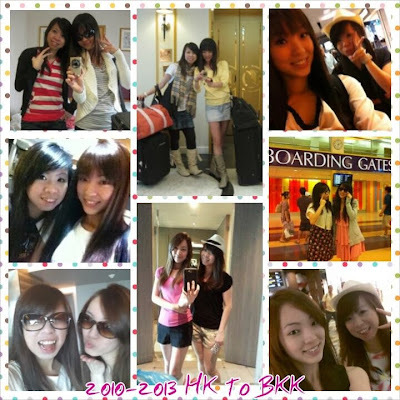 I lost 2 more KGs after this trip and overall, I lost a total of 5 KGs! Yeah, now I feel light and hope my health condition is not in any red light. :) I suffered from hormonal imbalance past 1 year plus and it was a tough battle with occasional outbreaks on face, mood swing and weight gain. I only hope he will understand and be there for me in the past. But now, I'm learning to cope it. I will learn to be back my confidence self and be positive than ever. Thanks all!